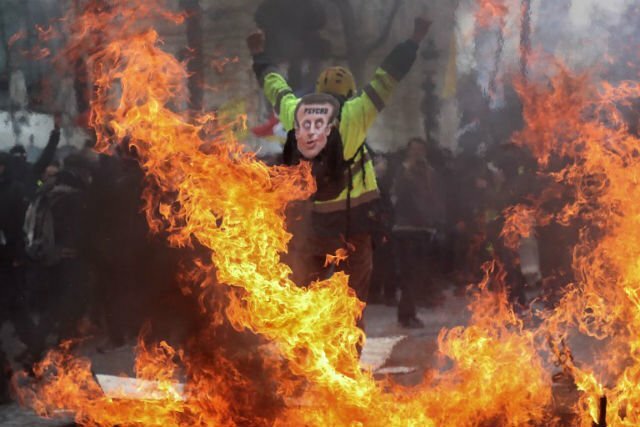 PARIS (AP) — French yellow vest protesters set life-threatening fires, smashed up luxury stores and clashed with police Saturday in the 18th straight weekend of demonstrations against President Emmanuel Macron. Large plumes of smoke rose above the rioting on Paris’ landmark Champs-Elysees avenue, and a mother and her child were just barely saved from a building blaze. Cobblestones flew in the air and smoke from fires set by protesters mingled with clouds of tear gas sprayed by police, as tensions continued for hours along the Champs-Elysees. One perilous fire targeted a bank on the ground floor of a seven-story residential building. As firetrucks rushed over, a mother and her child were rescued as the fire threatened to engulf their floor, Paris’ fire service told The Associated Press. Eleven people in the building, including two firefighters, sustained light injuries, as other residents were evacuated. Paris (AFP) – After weeks of declining participation, France’s “yellow vest” protest movement attempted to rebound on Saturday with a major rally in Paris which quickly turned violent. A large crowd gathered on the Champs-Elysees avenue for the 18th straight week of anti-government protests which initially rocked President Emmanuel Macron’s administration, forcing him to adopt more anti-poverty measures, but had appeared to fizzle in recent weeks. Police fired tear gas to disperse protesters who erected barricades near the Champs-Elysees in scenes reminiscent of some of the most tense “yellow vest” rallies. Saturday’s attempted reboot coincides with the end of two months of public debates called by Macron to take the heat out of the protests, which repeatedly ended in rioting in December and January. Demonstrators looted stores on the Champs-Elysees avenue in Paris on Saturday, on the 18th week of “yellow vest” protests, characterised by an uptick in violence after dwindling participation in recent weeks.